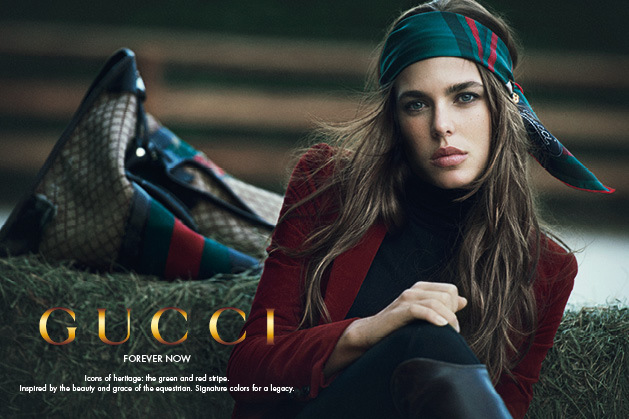 Gucci announced that it is extending its relationship with Charlotte Casiraghi, who will be the protagonist of the House’s new “Forever Now” advertising campaign series conceived by Creative Director Frida Giannini in collaboration with Charlotte. Casiraghi. Over the course of the next two years the new campaign will see Charlotte portrayed by four of the world’s most respected fashion and portrait photographers in a series of sittings celebrating the House’s renowned icons. The first portraits tell the story of Gucci’s signature green and red stripe through the lens of Peter Lindbergh. Shot against the backdrop of a stable, the intimate photographs of Ms. Casiraghi evoke founder Guccio Gucci’s fascination with the art of riding. It was Guccio Gucci who appropriated the green and red stripe from the canvas girth strap of the horse’s saddle. In the Fifties he first applied these colors to the trim and detailing of luggage and travel trunks, since then the stripe with its unmistakable colors has become an immediate visual reference to the House of Gucci. Today, this legacy continues with Frida Giannini's special equestrian designs for Charlotte Casiraghi. The riding wardrobe Giannini has created for Ms. Casiraghi is highly technical but luxurious and features distinctive bearings of the House's own heritage, including the houses iconic green and red colors as well as the Gucci Crest and the finest of materials. 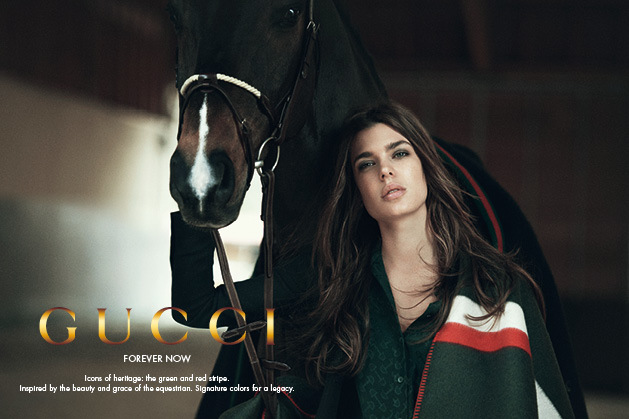 During the Fifties, Gucci again found equestrian inspiration with its trademark green-red-green web stripe, derived from a traditional saddle girth. It became an instant success and an instantly recognizable hallmark of the brand. Opening stores in Milan and New York, Gucci started to build its global presence as a symbol of modern luxury. 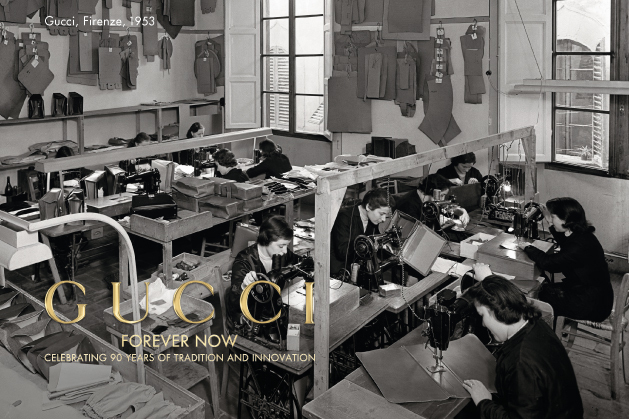 With the passing of Guccio Gucci in 1953, his sons Aldo, Vasco, Ugo and Rodolfo took over the business. Gucci is re-launched to global renown through a groundbreaking mix of tradition and innovation. Tom Ford became creative director of Gucci in 1994 and infused the luxury brand with a sense of daring and provocation that resonated with celebrity and the fashion world. The stiletto, and silk cutout jersey dresses with metallic hardware details became instant icons of Ford's uniquely glamorous vision. Domenico De Sole was appointed CEO in 1995, and Gucci made the highly successful transformation to a fully public company. Gucci is named "European Company of the year 1998" by the European Business Press Federation for its economic and financial performance, strategic vision and management quality. In 1999, Gucci entered into a strategic alliance with Pinault-Printemps-Redoute, transforming itself from a single brand company into a multi-brand luxury group.